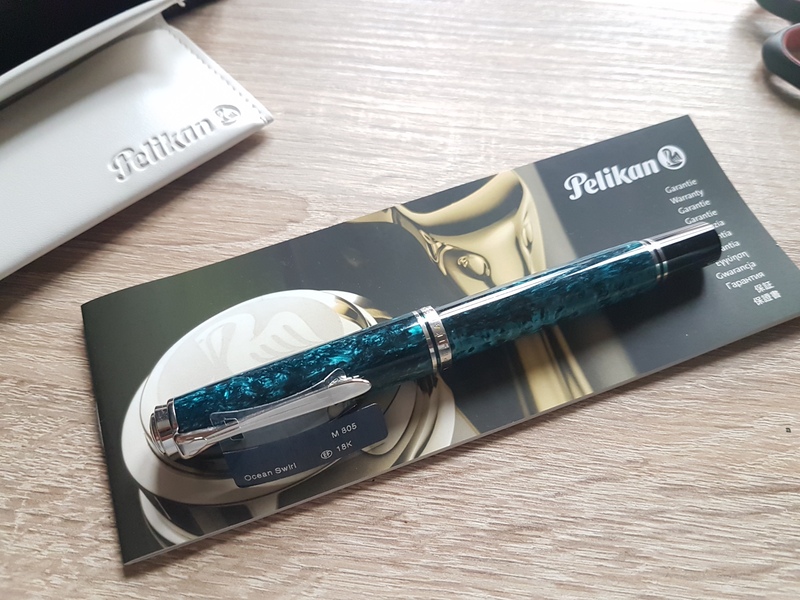 Pelikan Ocean Swirl M805 'EF' - Special Edition of the year 2017. Due to extra expenditures in regards to my education, I find myself having to part with the most prized pen in my collection. Originally bought in April 2018 as a pen to celebrate the successful ending of a semester, this pen has seen very little use and has been inked twice at most. The pen comes with all the original pamphlets, original box, faux leather sleeve and even the original tag. There should be absolute minimum signs of use. Please note that the all-rhodinated M805 nib has been swapped for a two-tone M800 EF nib. Kindly asking SOLDPlease PM if you would like a writing sample or if you have any further questions. I will be shipping from Denmark. For a more accurate representation of the colors, please check out the pictures in the album above. This video is meant to give a 360-degree overview of the swirls of the material. Last edited by vPro; March 28th, 2019 at 12:44 PM. Price reduced. Please feel free to inquire if you have any offers or questions. Why did you swap out the nib? I prefer the look of the two-tone nib. Yes, the pen is still available. Hello vPro, can you please clear some of your inbox? I am trying to reply, but receiving an error stating that you cannot receive messages because your inbox is too full, thanks.